Khalil Mack is good. #Analysis. The Philadelphia Eagles are headed back to the postseason for the second straight year, except this time around they'll have to navigate through Chicago, New Orleans, and then ??? to get back to the Super Bowl, whereas last season they made it much easier on themselves by earning home field advantage. Their first opponent, the Bears, can make the case that they have the best defense in the NFL. Here are five matchups to watch when the Eagles have the ball. As you can see, Mack leads the above list of future Hall of Famers and/or great players in forced fumbles, and is third in sacks over that period. Wentz won't practice, but will stay on Eagles active roster as playoffs begin... why? Also, you know what all the above players have in common? They all faced the Eagles at least once over the last two years, mostly against Johnson, who is easily the best right tackle in the NFL. In 2017, he was very clearly the best offensive tackle (not just right tackle) in the NFL. While he has fallen short of the "best offensive tackle... period" status overall this season, he has played a lot more like that guy over the last two or so months, as he has gotten healthy from a few significant early-season injuries. Facing star pass rushers is nothing new for Johnson. He does it almost every week. In addition to most of the guys in the above graph, over the last two seasons, Johnson has faced guys like Demarcus Lawrence, J.J. Watt, Joey Bosa, Justin Houston, Michael Bennett, Jason Pierre-Paul, Julius Peppers, and Calais Campbell, among others, and he almost always gets the better of them. 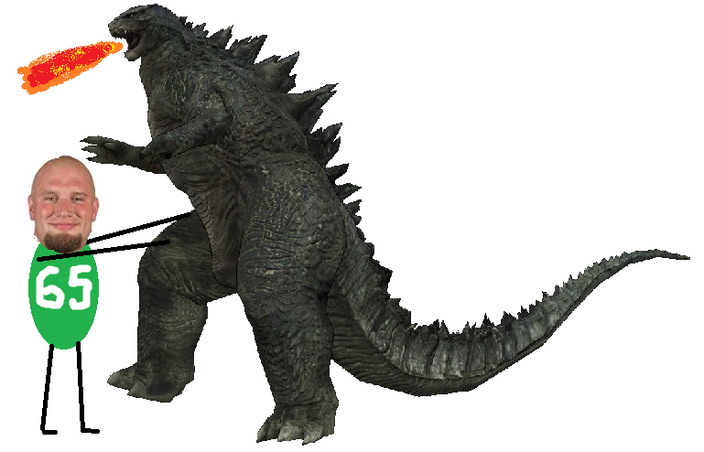 Last season, Johnson rhetorically asked, "Who else am I going to see, Godzilla out there?" In the locker room after the Eagles playoff-clinching win against the Redskins last Sunday, Johnson was reminded that he'll be facing Khalil Mack next weekend. "My job is always fun," he said. The other stud in the Bears' front seven is Hicks, an interior defensive lineman who, like Mack, Chicago also likes to move around. 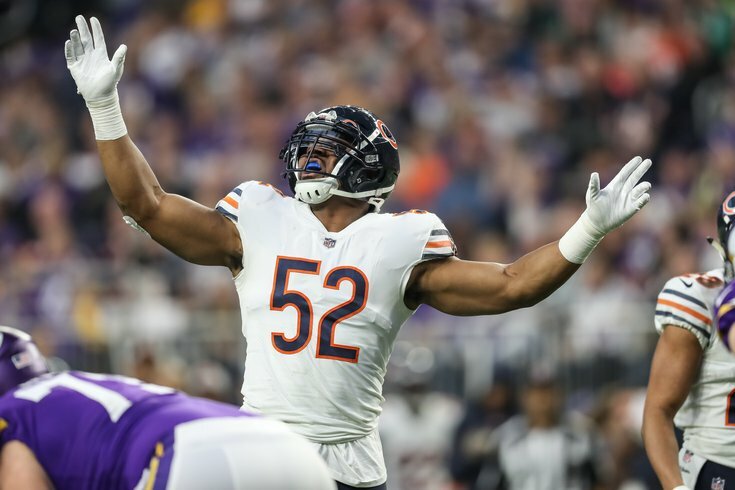 Over the last three seasons since joining the Bears, Hicks has 163 tackles, 23 sacks, 5 forced fumbles, 3 fumble recoveries, 7 batted passes, and 53 hits on the quarterback. Hicks mostly lines up opposite the RG, which for the Eagles would obviously be Brandon Brooks. Like Mack vs. Johnson, Hicks vs. Brooks is strength vs. strength. The Eagles will have to be able to keep Mack and Hicks away from Nick Foles, but they're much better equipped to do so than most. In addition to allowing the fewest rushing yards per game, the Bears allowed the fewest rushing TDs (5), the fewest rushing first downs (67, or just 4.2 per game), the fourth-least rushes of 20-plus yards (7), and they allowed the fourth-fewest yards per carry (3.8). Against the Texans, even with a lead for most of the game, the Eagles passed 50 times vs. 22 runs. "That front seven, eight guys with their safeties, they do a really good job," said Doug Pederson in his post-game press conference after the Birds' won over Houston. "They create different angles for our offensive linemen. So some of the things that we've been able to do in the last couple weeks, they just kind of took us out of it. I knew we were going to have to run the ball late in the game, even when we were up by 13 there, 29-16, I felt like we could get a little momentum, run the ball, make them use time outs and maybe we could finish the game at that point, but we didn't do it. It was just great defense." For you "RUN THE BALL!!!" folks, getting the rushing attack going would be great for the Eagles if they can do it, but don't expect Pederson to continuously run it into a brick wall if it's not there. As you can see in the chart above, the Bears didn't just pick off opposing quarterbacks. They turned those picks into scores going the other way. The Bears had six players with at least 2 INTs. CB Kyle Fuller led them with 7 picks, with S Eddie Jackson right behind him with 6 (and 2 TDs). While Nick Foles has been accurate, he has had at least one throw in each game where it's like, "What the hell was that?" He can't have too many of those on Sunday, because the Bears make you pay for mistakes. Against a team that does such an incredible job of turning teams over, Pederson should be relying on his most trustworthy route runner and catcher of the football, which is obviously Ertz. In my view, from a 60,000-foot view, the Eagles' offensive game plan should focus on players, not plays, and Ertz is the best skill position player the Eagles have. There should be no "too much Ertz" in this matchup.